The Moosey Garden is full of wiggling, rambling paths to explore. I've created them quite randomly - often, after a garden has been planted, to add shape to a higgledy-piggledy border design. Most (not all) have sensible destinations, and inviting garden seats en route. Taj-dog, the first Moosey dog, showed good sense when defining a path. He was nice and direct, with a just few diversions to inspect points of interest. Paths that Taj-dog 'designed' for me are (naturally) called dog-paths. My favourite surface is a soft bark mulch, and I use firewood logs or river stones for edging. Such a path can be shifted in a few minutes, or removed totally without any fuss. Some of my paths require much flexible bending to successfully be negotiated. Some need a sign banning wheelbarrows. Funny how other people's paths are always more exciting than my own. I guess I always know where my paths lead to. One thing is for certain - none of the Moosey paths will ever stay the same for very long. Digging of the Stumpy Garden was completed in the year 2003, and a network of delightful little winding paths has taken shape over the following years. They wriggle happily through the rhododendrons near the water. Gardeners (and the household pets) used to have a wet grass trip from the house decking around to the back door. That was before a small path of paving stones was laid along the edge of the lawn. Any female gardener young and silly enough to belong exclusively to the 'Girls Can Do Anything' club - this series of articles is not for you! It contains helpful hints for the manipulation of non-gardening partners (or NGPs) into generally helping in the garden. This article deals with DIY paths. The Hen House Garden paths are a network of paths from Rooster Bridge to the hen house and through the gardens to Duck Lawn, the grass area beyond. 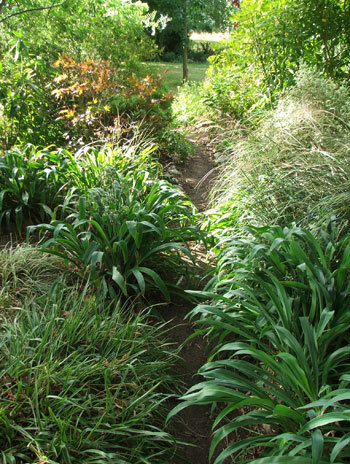 The main path through Middle Garden starts at Middle Bridge by the water race and winds gently through the plantings to reach the grass beyond. It forms the main route from the house through to the Hazel Orchard.